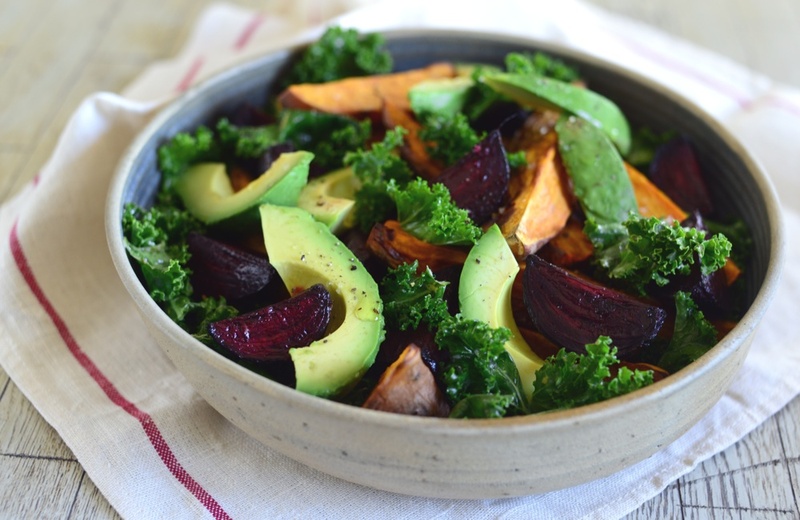 This super satisfying and tasty salad is packed with nutrient dense whole foods. Preheat oven 180°C and arrange racks in the top and bottom thirds of your oven. Place the sweet potato wedges in a large baking tray, drizzle with half the regular olive oil and season generously. Place the beetroot in a separate baking tray, drizzle with remaining olive oil and season generously. Spread the vegetables out evenly so they don’t steam. Bake for about 45 minutes, swapping the trays once and giving them a good shake midway, until tender and beginning to caramelise. Remove from the oven and allow to cool a bit. Meanwhile, combine mustard, zest, lemon juice, extra virgin olive oil and seasoning in the base of a wide mixing bowl. Add the kale leaves and use your hands to massage the dressing into the leaves- they should look shiny and feel soft. Set aside for at least 15 minutes. To serve, add the roast vegetables to the kale and toss to combine. Carefully fold through the avocado wedges and check seasoning. Arrange on a platter or divide among dinner plates.